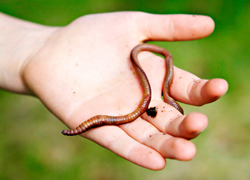 The simple earth worm creates one of the most valuable resources on earth, worm castings, Nature's Ultimate Plant Food™. When earthworms feed on organic matter from plants and animals they convert it into tiny odorless pellets, coated in calcium and filled with minerals and micro organisms. How do worm castings help? When added to the soil in your pots, your garden, your grass, your raised garden, or wherever you grow plants and vegetables, this vital substance brings both the soil and the plants to life. Worm castings provide vital micro-organisms and enzymes that help break down organic matter in the soil so that is it more easily absorbed by plant roots. It also helps strengthen plants' immunity to various funguses. Plants of all kinds, vegetables, flowers, bushes, grasses, trees, grow healthier and bigger with Vermicyle® Organics worm castings related products. These pure worm castings are mixed in your soil to provide the ultimate food for your plants. They are sold in 1 gallon bags, 35 lb bags, or in bulk. The Tea Mix becomes a spray to protect leaves and stems from bugs. A couple of handfuls of the mix soaks in a gallon of water over night, and can then be sprayed on your plants, both indoors and outdoors. The Tea Mix is sold in 1 gallon bags, 35 lb bags, or in bulk. The compost is a special mix with worm castings that is an ideal planting soil. You can grow plants directly in it, or mix it in with your soil. It is excellent for raised beds. Vermicompost is sold in 1 gallon bags, 35 lb bags, and in bulk. It is also packaged into special growing bags as My Organic Garden. My Organic Garden is your organic garden in a bag. Filled with Vermicycle® Vermicompost, it comes in a couple of sizes for your convenience: a small bag if you have a very small patio or window sill for plants; and a larger bag if you have more space and want to plant up to three plants. You can plant straight into the bag. Vermicycle's Vermicompost already has hardly any weed seeds in it, and when you have the additional protection of the plastic, even seeds that the breeze or birds drop by are less likely to get in.